0:12Skip to 0 minutes and 12 secondsWhy is fitness important for the surgical patient? Well, I think fitness is important for the surgical patient, because in general fitter people live longer. And that's true apart from the surgical patients. That's true in life. If you survey populations, we know that the sort of three to seven year likelihood of the chance of dying is greater if you're less fit compared to fitter patients. Now when it comes to surgery, the perioperative population, there've been a lot of studies to show that the fitter you are, the lower the chance of you dying during that episode. And of course that's raised the question of can we do anything about that? 0:50Skip to 0 minutes and 50 secondsCan we exercise, or can we get patients fitter before surgery to reduce their chance of dying? So we sometimes measure fitness before surgery to help in the consent process, to help patients and surgeons decide what's best for the patient, and sometimes to diagnose specific problems. 1:13Skip to 1 minute and 13 secondsHow do you perform an exercise test? So there are a few types of tests. But we use a maximum symptom limited test in our lab. A cardiopulmonary exercise test, it looks at what happens to your heart, lungs essentially, when we exercise over about a ten-minute period. So first of all we meet the patient, of course. Greet them. And take an exercise history, and make sure there are no contraindications to doing the test. We take a haemoglobin estimation, because, of course, low haemoglobin would limit the amount of oxygen-carrying capacity, and therefore oxygen getting to your muscles; and your exercise capacity. So after we've done those things, the subject sits on a bike. 1:58Skip to 1 minute and 58 secondsWe do some baseline measurements at rest, with no pedalling, 12-lead ECG, oxygen saturation, noninvasive pressure. And of course measure our baseline gases-- our VO2 and VCO2, which is recorded at room air. Then we ask the subject to pedal gently against no resistance. And then after a few minutes-- three minutes in our test protocol-- excuse me-- the work gets harder. It gets more resistance. There's more resistance, so that the patient, subject, has to work hard and work harder and harder and harder. And of course, the heart rate goes up, blood pressure, and so on. The breathing rate goes up-- until they can go no more. 2:38Skip to 2 minutes and 38 secondsAnd at that point, we stop the test, and we carry on recording, and let the patient wind down. 2:46Skip to 2 minutes and 46 secondsWhat happens when we exercise? So when we exercise, we breathe faster to take in more oxygen, and get rid of more carbon dioxide. And we increase our cardiac output-- stroke volume, heart rate-- to deliver the oxygen to the mitochondria in the muscles, and get rid of the CO2, which is a product of aerobic respiration. So we could measure those changes by recording in real time during our cardiopulmonary exercise tests, breath by breath, the differences between the inspired oxygen and expired oxygen-- so that will be whatever oxygen we've taken in of VO2-- and the difference between the expired and inhaled CO2, which will be how much CO2 we've made. 3:31Skip to 3 minutes and 31 secondsHow do you judge fitness based on an exercise test? So we can look at lots of measurements during exercise tests, but we often use three. , Firstly the VO2 peak. Secondly, the VO2 at the anaerobic threshold-- also called anaerobic threshold-- and the VCO2, also called the ventilatory equivalent of the CO2, the anaerobic threshold. So let's deal with those in turn, I think. So the VO2 peak, that's the easiest to understand I think. It's the maximum oxygen uptake in the test right before we stop exercising. So it's the peak VO2, the highest recorded measurement. Secondly, the anaerobic threshold. It's actually a measurement of VO2. So we really should say the VO2 at the anaerobic threshold. 4:17Skip to 4 minutes and 17 secondsThat's the VO2 at which we start to detect the body using anaerobic metabolism to augment their aerobic metabolism. How do we do that? We start to measure extra CO2 being made. The CO2 has come from the buffering of the hydrogen ions that come with lactate. So when we respire anaerobically, we make extra hydrogen ions, which combine with bicarbonate to make carbonic acid, which then partly dissociates to make water and CO2. So it's that extra CO2 that we're detecting. The third thing, this thing called ventilatory equivalent of CO2, which is the minute ventilation-- how much we breathe-- divided by how much CO2 we're putting out. We measure this at the anaerobic threshold. 5:08Skip to 5 minutes and 8 secondsSo if you think about this a bit more, it's how much we breathe divided by how much CO2 we're making. So actually you could regard it as how much breathing you have to do to get rid of a litre of CO2. And if you think of it that way, you can think, well, actually you want that number to be a low number. You don't want to be have to breathe in, be breathing a lot to get rid of your carbon dioxide. So the more efficient our lungs are, and our heart/lung units are , our V/Q matching is, the less we need to breathe to get rid of carbon dioxide. Of course, we also have 12-lead ECGs. 5:47Skip to 5 minutes and 47 secondsAnd we could also look at the rhythm, of course, and ischaemic changes on the ECGs, the oxygen saturations, and how the lungs themselves respond during exercise. 5:59Skip to 5 minutes and 59 secondsHow are the results used in practice? We use the results from the exercise testing based on the fact that fitter people do better after surgery. That's some headline news, isn't it? So we can use that in shared decision-making with patients and surgeons of course, planning postoperative care-- where might the patient go after surgery? We use some specific interventions. For example, if a patient has the SVT during surgery, or some other cardiac issue, we may discuss that with a cardiologist. And lastly, there is an increasing movement to have exercise programmes if there is an appropriate timescale between testing and surgery. In the video Dr Robert CM Stephens, an anaesthetic consultant at UCLH, discusses Cardio Pulmonary Exercise Testing, or CPET. Throughout the article he expands on some of the key points made in the video. Measuring someone’s VO2 peak is considered the gold standard for measuring fitness, and is used by elite sport teams to guide training in athletes. 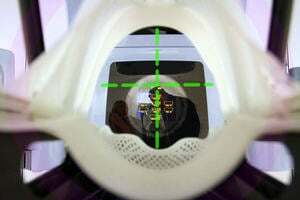 However, in hospital it can be used by perioperative physicians before surgery to help quantify surgical risk, and by respiratory physicians to investigate causes of breathlessness. 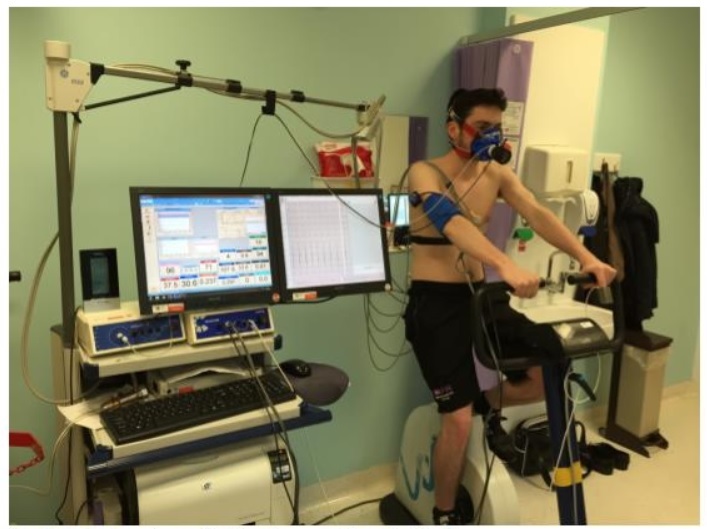 But what is VO2, how do we measure it, why might it relate to fitness and how can we use it around the time of surgery? When we are sitting quietly we breathe in 21% O2 and expire about 16%. This means that we’ve taken up 5% of that breath’s oxygen through our lungs, into the blood, heart and around the body. If we think of someone breathing at rest at about 10 breaths a minute and each breath is about 500 ml, then we can work out what our baseline oxygen uptake is. In this example, 5% of the amount we breathe each minute (10×500=5000ml, the minute ventilation) is 250ml/minute, which is the VO2 at rest; the name is derived from V - volume, O2 – oxygen. This would be the equivalent to one Metabolic Equivalent of Task; one MET; the oxygen used sitting quietly. This is of course just an example, the real values will be higher or lower based on several factors such as age, gender and weight. For this reason its units are usually quoted in ml/kg/min to try to account for the effects of size. For the example above, if the patient weighed 70kg their resting VO2 would be 3.6 ml/kg/min ie 250/70). When we exercise, we breathe in the same 21% O2 and expire 16% (although this does change a little) but increase our breathing depth and rate, hence our VO2 goes up (the % difference between the inspired and expired multiplied by the volume breathed each minute). In this way we don’t really ‘store’ oxygen; we take in what we need to burn fuels to do the work at the time. The maximum VO2 recorded when someone undergoes a CPET is called the VO2 peak: the highest recorded value usually just before we stop exercising through exhaustion. Of course VO2 peak is partly a matter of fitness- fitter people can exercise for longer and harder - but also a matter of how motivated you are to carry on exercising. Volume of co2 (VCO2) is also measured - we will hear why this is also important later. In the figure above you can see the values achieved in a CPET. On the x axis is time (minutes) and the y axis, VO2 and VCO2 (both in litres per minute) and work rate (watts). The baseline resting VO2 of about 0.35 L/min in blue rises to about 0.5 L/min in ‘unloaded’ exercise, against minimal resistance. 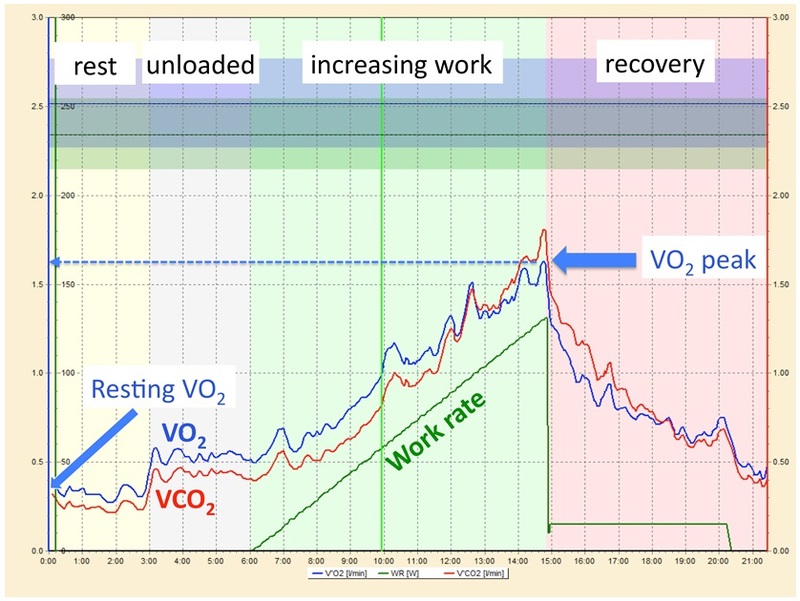 When the work rate increases (green straight line) from 6 minutes both the VO2 and the VCO2 (red line) increase until the subject can continue no more (here at 15 minutes). In this example, the VO2 peak is about 1.6 litres a minute. As the resting VO2 was 0.35/min (1 MET as they were at rest) and the peak 1.6 L/min, the subject achieved (1.6/0.35) just over 4.5 MET. The horizontal coloured bands near the top represent predicted VO2 values. When we start exercising, the energy we need is made almost totally aerobically (involving oxygen) and we can carry on exercising almost indefinitely. If we increase the intensity of our exercise (as we do in an exercise test) we will cross the anaerobic threshold, find it increasingly hard to continue, and eventually stop. It is this extra CO2 that allows us to detect when the anaerobic threshold has been passed. Fitter people are able to exercise more before they need to supplement their aerobic energy generation with extra energy from anaerobic metabolism - so they have a higher anaerobic threshold. As with VO2 peak, the units are ml/min/kg, but unlike VO2 peak the anaerobic threshold is not determined by how motivated you are. As well as VO2 peak and the VO2 at the anaerobic threshold, a third value is associated with outcome after surgery: the ventilatory equivalent for CO2. The ventilatory equivalent for CO2 is the minute ventilation divided by the VCO2 at any given timepoint, but usually we quote the value at the anaerobic threshold. It can be thought of as the volume of breathing each minute needed to get rid of a litre of CO2- and so is a measure of the efficiency of the lungs at gas exchange. Lower values generally indicate more health and better matching between breathing and blood flow in the lungs (‘V/Q matching’). How do we do perform CPET? A CPET involves the measuring of respiratory gases (oxygen consumption and carbon dioxide production) continuously through a tight-fitting mask whilst gradually increasing the effort needed to exercise. After calibrating the equipment, a medical history is taken and the patient’s height and weight measured. They perform spirometry to give lung volume measurements that are used to calculate their predicted ‘normal’ values in the CPET. 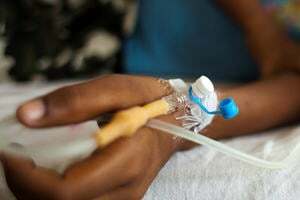 Haemoglobin is often measured to exclude anaemia, which is likely to underestimate a person’s exercise capacity as it would limit oxygen delivery. During the test, the patient often sits on a on a cycle ergometer with full 12 lead electrocardiography (ECG), non-invasive blood pressure (BP) and oxygen saturations being measured. After getting data at rest, the patient cycles gently, then against increasing resistance making it harder and harder to exercise. At some point the patient stops as they feel they can’t continue. The entire test involves only 8 to 12 minutes of exercise. We know that in general life, quite apart from patients having surgery, fitter people survive longer and have fewer illnesses. It does make sense then that when people have major surgery - which involves a big ‘challenge’ to their body - that people who can move more O2 into their bodies, and hence to the cells needed for wound healing and normal organ function, would likely fare better than patients who can’t. How can we use CPET results?